Imagine being able to get a bright, vibrant, 80" diagonal image from a projector placed only three inches from the screen. Imagine not having to place a projector on a conference table right in the middle of your audience, so they don't have that noise and heat in their faces. Imagine not having to worry about getting in the light path and casting shadows on your presentation, and never having to squint your eyes against the glare of the lamp. Well, this isn't just a dream. Sanyo has made it a reality, with the PLC-XL50. The PLC-XL50 is touted as having the world's shortest throw distance. In point of fact, it can display an 80" diagonal 4:3 image from a mere 3" away from the screen. It is great for conference rooms, and for spaces like storefront display windows where a conventional projector will not fit. 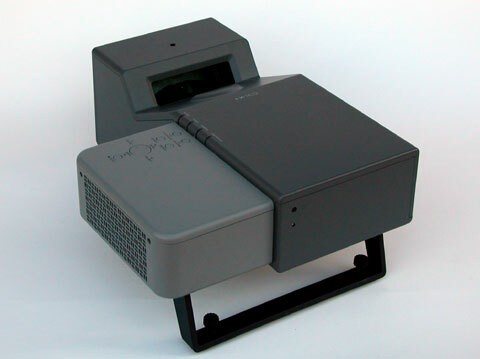 The XL50 is arguably Sanyo's most unique projector offered to date, and can simplify projector installation in almost every instance. It is available at street prices near $2900. Super-short throw distance. The Sanyo PLC-XL50 is an ultra-short throw projector, meaning it can display very large images while only inches away from the screen. In fact, when the projector is placed flush with the screen's surface - in other words, a throw distance of zero inches - it displays a 70" diagonal 4:3 image. From three inches away, the image is nearly 80" diagonal. The largest image we were able to obtain was a massive 144" diagonal - that's 86" tall by 115" wide - which was measured at a throw distance of only nineteen inches. High lumen output. The XL50 test sample we received delivered a whopping 2126 ANSI lumens in its brightest (Dynamic) mode, despite being rated at 2000 ANSI. We can count on our fingers the number of projectors that have exceeded their published lumen specifications. In "Real" mode, which gives excellent color performance, the XL50 measured 1701 lumens. This gives the XL50 enough lumen power that ambient light should not be an issue unless it is shining directly on the screen. The Sanyo PLC-XL50. For more pictures, see the bottom of this review. Accurate color. In "Real" mode, the XL50 did an excellent job of displaying a pleasant, well-balanced picture free of overt color bias or oversaturation. Photographs displayed on the XL50 in "Real" mode looked natural and vibrant. Other image modes such as "Dynamic" and the user-programmable modes have a greenish cast which can be taken out with proper calibration, but "Real" mode is the best out of the box choice for the display of material where color accuracy is a priority. High throw angle offset. As a necessity of the XL50's unique construction, the projector has a high throw angle offset to help the bottom edge of the image clear the projector's case. The bottom edge of the projected image appears 18% of the image height above the lens. For example, on an 80" diagonal image, the bottom edge will be roughly 9" above the projector. The XL50 itself is nearly 8" tall, so the total distance between the mounting surface and the bottom edge of the image on an 80" screen would be about 17". This sharp upward throw also allows presenters to get much closer to the screen without the discomfort of staring into the projector's lamp or the hassle of blocking important details with one's shadow. Even standing mere inches from the screen, a presenter will not cast a shadow in the projected image. Relatively quiet. The XL50 is a powerful projector, and its 275W lamp puts out a reasonable amount of heat. Nevertheless, fan noise is low in pitch, and the XL50 is much quieter than many other 2,000 lumen XGA projectors, in part due to its larger size. Because of the XL50's unique short throw lens, the projector is placed near the screen instead of on a conference table or a cart in the middle of the room. This keeps fan noise and heat exhaust well away from your audience, ensuring that neither of these factors will cause any distraction from your presentation. No long cable runs. The XL50 sits up close to the screen, which is generally where one stands while making a presentation. This has the added benefit of keeping the projector and your laptop close together, eliminating the need for long cable runs. With the projector up at the front of the room, you can simply plug in and get to work.